Your support will help continue the fight for human rights! You may see Amnesty International fundraisers on the street or coming to your doorstep to talk to you about becoming a monthly donor. Please consider joining us as a monthly donor today. Why does the Amnesty International do door-to-door fundraising? Door to door fundraising is one of the most effective and personal ways we can reach out to donors. Amnesty International believes all people have fundamental human rights, but those rights are abused or denied every single day. With your donation, Amnesty International is able to continue our research and document human rights abuses and mobilize millions of supporters to campaign for change. How do I know if a fundraiser is from Amnesty International? All Amnesty International fundraisers have identification badges (as seen below) and name tags. They can also process your donation electronically on a tablet. Do you accept cash gifts? No, we do not accept cash or coin gifts, this helps protect both the donor and fundraiser. If you wish to make a monthly gift, our fundraisers will accept void checks for Electronic Funds Transfer (EFT) and credit card payments. Is it safe to give personal and financial information to the fundraisers? Yes, we use tablets with encrypted software to collect payment information in a secure way. All the data we collect is immediately uploaded to our remote servers, processed and then completely removed from the tablet. Once processed, your financial data is further encrypted according to Payment Compliance Industry (PCI) Standards. What are the benefits of donating/converting to a monthly gift using EFT or American Express? Account information for AMEX/EFT, unless specifically requested by the cardholder, does not expire or terminate. Therefore, you will be able to continue to give without worry of outdated information. 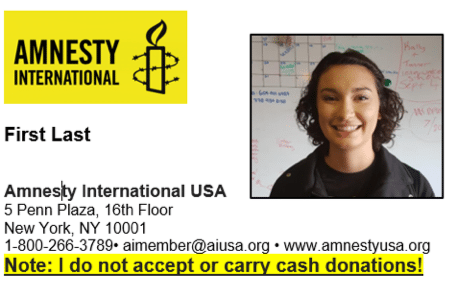 Less administrative costs from Credit Card institutions and more of your donation will go directly to Amnesty International USA to continue the fight for human rights! I have signed up, but how do I know I am a monthly donor? Thank you for joining us as a monthly donor. You will receive an email confirmation immediately. If you haven’t received any of the above please call us at 1-800-AMNESTY to confirm. What if I want to cancel or change my giving? You can cancel your monthly gifts at any time by calling 1-800-AMNESTY or email [email protected] You may also reduce or increase your donation amount or change your gift schedule simply by calling or emailing us. When and how will I receive my tax receipt? You will receive a consolidated tax-receipt for all your donations in a specific year at the beginning of the following year – usually in February to the address that you have provided.